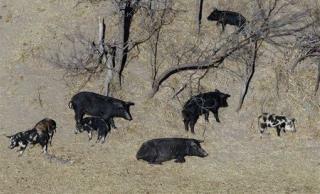 (Newser) – Texas Agriculture Commissioner Sid Miller is stepping up his war on feral hogs with a move that he says will bring about an "apocalypse" for the crop-destroying animals. Miller has approved the use of the pesticide warfarin to poison the state's 2.5 million or so wild hogs, reports Gizmodo, which calls the step "chemical warfare" but notes that feral hogs cause an estimated $1.5 billion in damage nationwide every year. "They're so prolific, you can't hardly keep them in check,” Miller tells the Austin American-Statesman. "This is going to be the hog apocalypse, if you like: If you want them gone, this will get them gone." This has "bad idea" written all over it. Dumping large amounts of poison attractive to omnivores seems like very poor judgement. Not to mention large numbers of rotting pig carcasses. I'm with the hunters and trappers. Have a giant "hunt-a-thon" and get pig hunters from all over the country for a week pig killed competition. That should do it. The use of poison is always a bad itea. The trickle down effect will will be a disaster on all the creatures that feed on carrion. Poison is never a good idea!